Soldiers' Angels - More Veteran Mobile Food Distributions! More Veteran Mobile Food Distributions! 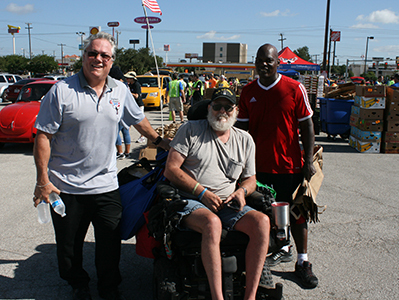 Soldiers' Angels Vice-Chair, Mike Wallace, and an Angel volunteer pose with a veteran attending the July Veteran Mobile Food Distribution in San Antonio, Texas. The veteran attended the drive-through event on his motorized wheelchair and, with the help of Mike and the volunteers, loaded the groceries on the back of his chair in reusable bags. The event in San Antonio was held on Thursday, July 20th in the parking lot of Rackspace Hosting. Concurrently, the Soldiers' Angels Veteran Mobile Food Distribution in Detroit, Michigan was also happening. Click here for more photos from this month's San Antonio Veteran Mobile Food Distribution or here for the Detroit Veteran Mobile Food Distribution.